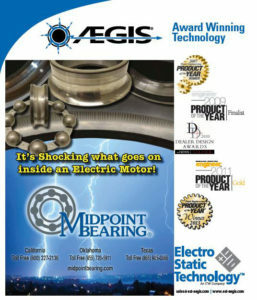 Electro Static Technology, An ITW Company, is a global manufacturer and inventor of AEGIS® Bearing Protections Rings used in electric motors and other rotating equipment to safely discharge variable frequency drive (VFD) voltages to the ground. AEGIS® Shaft Grounding Ring technology is installed in all ranges of motors from fractional horse power to large medium voltage motors used in virtually all commercial and industrial applications. AEGIS® Shaft Grounding Ring technology is the only technology that combines both contact and non-contact nanogap technology to reliably protect bearings from electrical discharges that cause pitting, frosting and fluting damage. AEGIS® Ring Technology uses proprietary conductive micro fibers arranged circumferentially around the motor shaft and secured in our patented AEGIS® FiberlockTM channel which protects the during operation. The following patents apply: 8199453, 8169766, 7193836, 7136271, 7528513, 7339777, and other patents pending.